Once upon a time...in a land far, far, away by way of Danville, IN there lived a girl who LOVED Disney characters, especially a particular red-headed mermaid. Alas, back in those days of yore, Princess- inspired Prom dresses were scarce, as was the internet, and the girl lacking ample time to shop selected a short, puffy, navy dress and enjoyed the prom with her friends. The End. Oh but it's not the end! 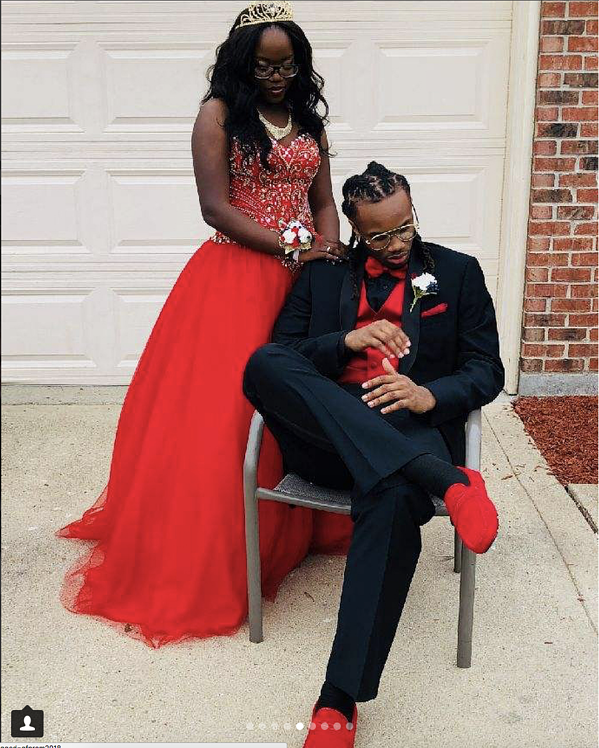 It's only the beginning as Princess-Inspired Prom dresses have been quite the trend as of late. 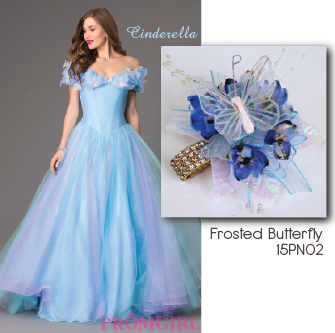 After viewing a superfluous amounts of fairy godmother turned fashion designer threads I decided to select a few of my favorite Disney ladies and pair a corsage with their perfect prom dress. Let us start with the frantic cleaning girl who started it all. The one who started it all. A fairy tale come true complete with a mouse-driven pumpkin carriage and famous glass slipper which changed a girl's story into a "Happily Ever After". The story is timeless, the dress is classic ball gown style with off the shoulder bodice trimmed with tulle ruffles and butterfly accents. The two-tone tulle skirt has sparkling sequins throughout to create extra enchantment. It was difficult to choose the perfect corsage for this leading lady but it seemed fitting to use our "Frosted Butterfly" which our designers created this season. Fascinating how it seems this corsage was made for this dress...or is it? Perhaps it was meant to be. While we're on the subject of ball gowns, dancing, and dreamy princes...well wait, not in this case. The Beast wasn't easy on the eyes at first because he behaved like a monster. But remember when Mrs. Potts voiced by Angela Lansbury starts belting out "Beauty and the Beast"? By that time the hairy beast was acting more like a prince and he looked quite charming in his blue jacket. 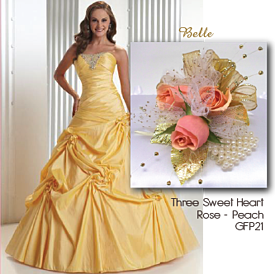 Yellow ball gowns are a challenging color so this Beauty inspired piece has been upgraded to a warmer gold. The structured bodice with ruching and the gathered skirt is an elegant modern twist on Belle's original dress. I matched the Three Sweet Heart Rose corsage with the roses in a soft, sweet peach. The pearl bracelet sports shimmery gold leaves and sheer gold ribbons and accent beading. "Tale as old as time" with updated colors for a glamorous finish. "Hold the phone! Mulan isn't a princess!" You're right, she's not however I love her character. She is a fierce, unstoppable woman warrior. What a role model! Oddly enough, there weren't many dresses which I felt truly depicted Mulan's character so I went ahead and chose a stunning long one shoulder red dress with delicate beaded accents. Simple and refined with an edge. 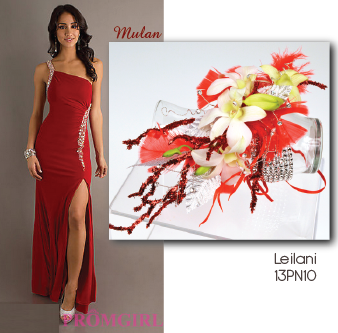 The "Leilani" corsage reflects the edginess of the dress with unique sparkling red accents, dendrobium orchids, silver leaves, and red feathers. Red is the key to this bold arrangement. A perfect fit for Mulan. Like what you're reading so far? 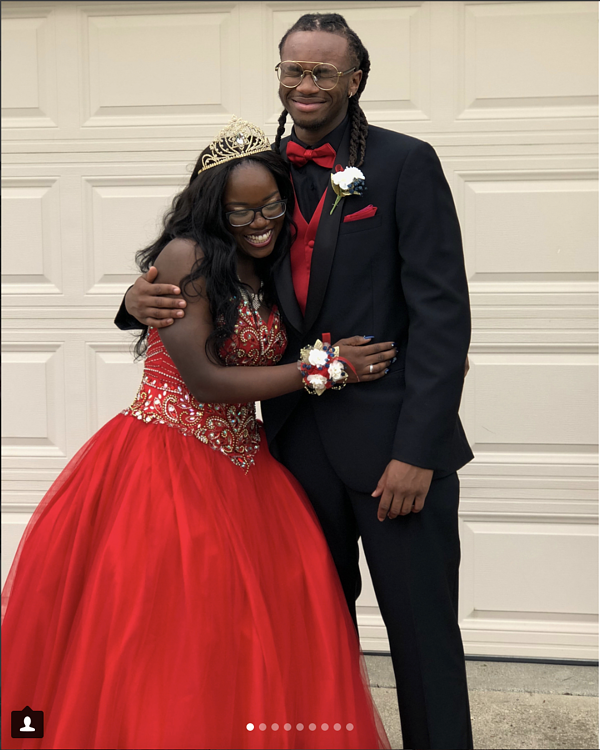 Read more about this princess inspired prom dress trend with matching corsages in Part Two of this series! Need to get some shopping done first and save Part Two for later? Check out our website for special occasion inspiration and browse our prom flower collection online! 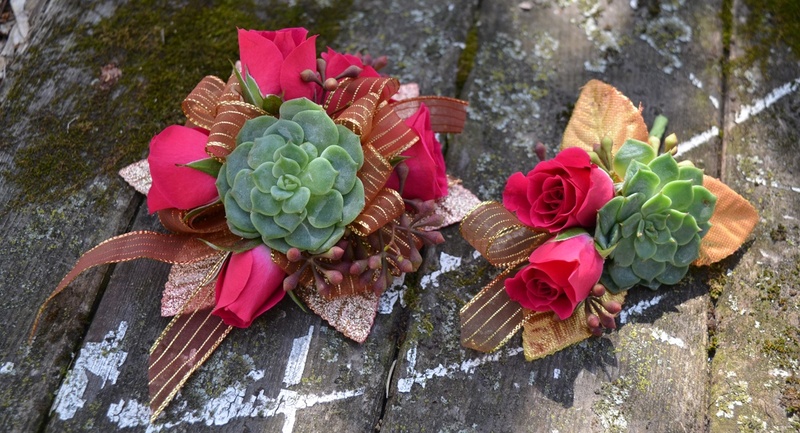 Welcome back to Part Two of our Prom Corsage Fit for a Princess Series! We started off Part One with the most famous Disney princess of them all: Cinderella and selected stunning corsages for Belle's beautiful ballgown and Mulan's simple yet striking one-shoulder long red dress. Which corsages will be worthy of the final fairy-tale inspired dresses? Let's find out together! We ended Part One discussing Disney ladies with names beginning with the letter "M" and the color Red; let's move onto the courageous Merida from Brave. Merida's dress of choice is flowy and sleeveless; which works out great if you're going to go to an archery lesson before or after prom. A versatile dress needs corsage of similar versatility therefore Pandora was selected. 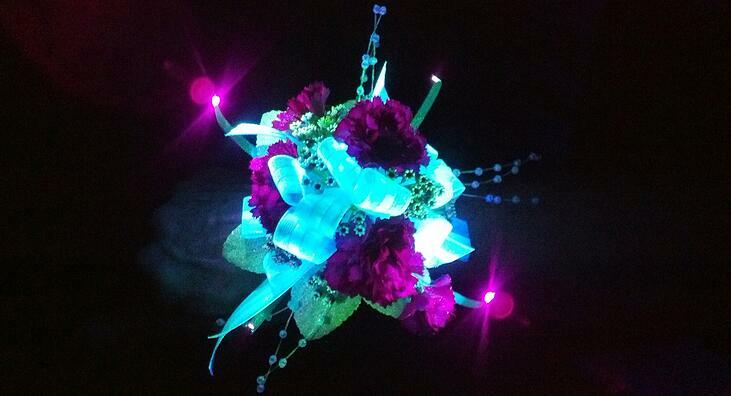 Perhaps the corsage should have been more simple with a bit of refinement but that's not Merida's style. 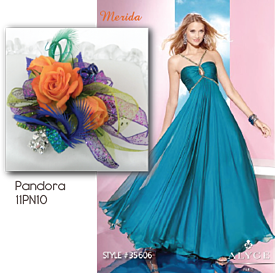 The vibrant orange spray roses, blue wire, mutiple ribbon colors and fun feathers fit Merida's attitude to the "T". Isn't that what we hope for in the finished prom dress ensemble? That it fits, not only physically but in personal style as well? I know, I know, can we all just "Let it Go" about Elsa and the cast of Frozen? Hasn't she had enough face time?! Sorry, not sorry but this dress is fabulous and has a couple of corsage placement options. Be assured it's just the dress...well..I do like the song, it's catchy. And the way she wields ice to make a castle was pretty neat too. Therefore we have decided Elsa needed to be on this list. The hi-lo dress is a vision in an icy turquoise with exquisite beading on the bodice. Forget putting anything on the wrist as it might interfere with this breezy chiffon; instead, add some extra fabulous to your strut with the "White Hot" corsage on your sparkling silver shoe! Another option would be an armband. Its swirling silver shape with sparkling leaves and barely pink kissed roses would accent the bodice and make a statemet; just like Elsa. Speaking of statement, remember when Disney introduced their first princess under water? The Little Mermaid is known as the movie which started the Disney Renaissance in 1989 so not only did it stand out in terms of quality which parallelled the classics such Cinderella and Snow White but also made a splash using a red-headed teenage mermaid as it's main character. Also, we're talking about mermaids! This Ariel-inspired dress is fancy, fun, and full of modern whimsy. The bodice is a sensational myriad of sequin delight trailing into the several layers of marine like chiffon. The orchids in our "Flirty" corsage pull the deep fuschia accents from the dress and we add white opalescent leaves, silver beads, and a stylish chunky rhinestone bracelet to complete the look. Prom dresses and princesses, I could keep writing on this subject for days! However we will end here with these lovely ladies with their fairy-tale inspired dresses and fantastic corsages which complete their dreamy ensemble. 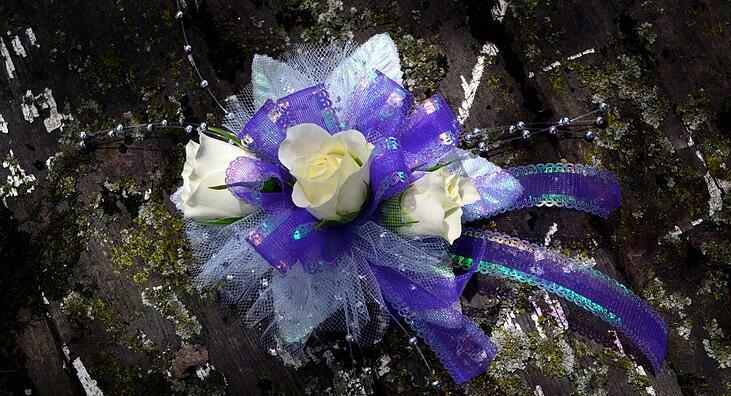 Are you in the middle of finding the "glass slipper" of corsages for your prom dress? Is your heart wishing for a dream prom ensemble? 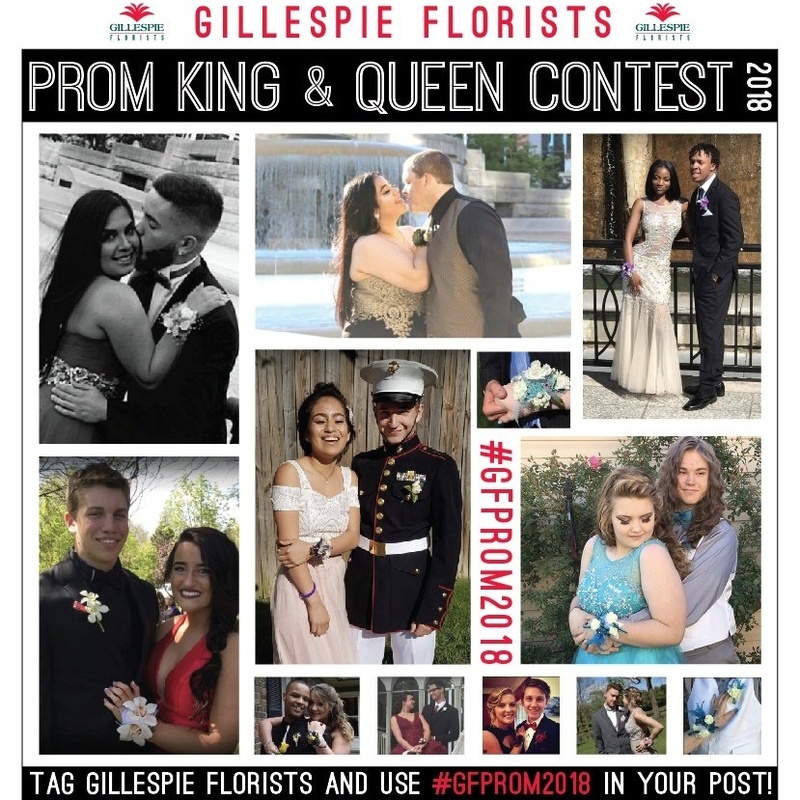 Gillespie Florists can help make dreams a reality with artfully designed prom flowers to complement your style. Check out our website for more ideas and stop by our shop to get started today! Prom! It's back and ready to vie for title THE "Hot Topic" and flood the internet with bff/dress selfies, fancy feast photos, and more. And you know what? We're ready. Bring it on, prom fiends! We've been doing our homework and stocking up on corsage accessories, flowers, and more and kick up to wow factor to your dress, evening, AND all the Facebook, Twitter, Tumblr and Instagram pics your trigger happy fingers are itching to take. 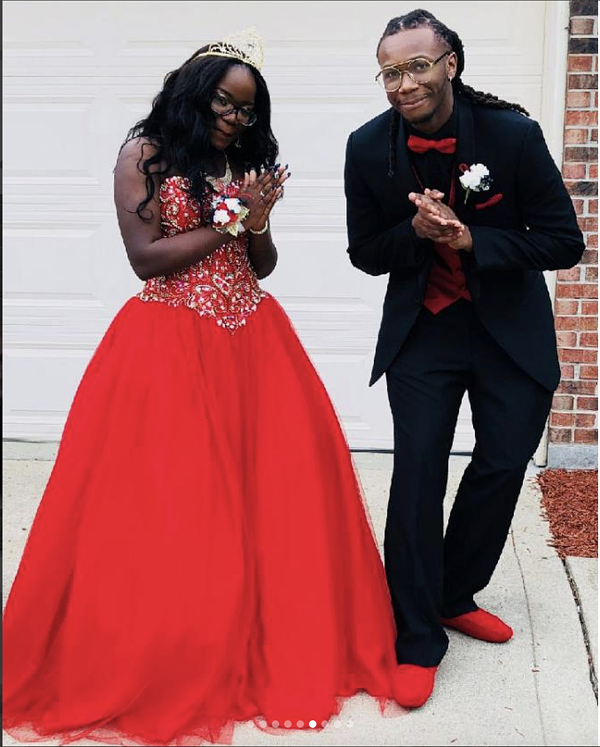 I could bore you with details on the hottest prom dress trends but we know you don't got time for that and chances are, your prom dress has been waiting patiently in your closet for months! So let's get straight to the point. BOOM! There it is. Such a small, minute sampling of what we have in store and on our website. Featuring elements of the latest trends for Prom in colors and accessories such as: lace detailing, posh pastels. red carpet bold colors, sophisticated bling, sheer fabrics, shimmering metallics, hot coral, and classic neutrals. And I also threw in a few of our favorite outstanding corsages because, 1. They're outstanding and 2. The possibilities for your dream corsage and boutonniere are endless. Sounds like alot doesn't it? It is. Just google "best prom dresses". "Ha! I've done that about a billion times already" you say. Then you know what I'm talking about. All the dresses are amazing, it's just a matter of finding the "One" for you. 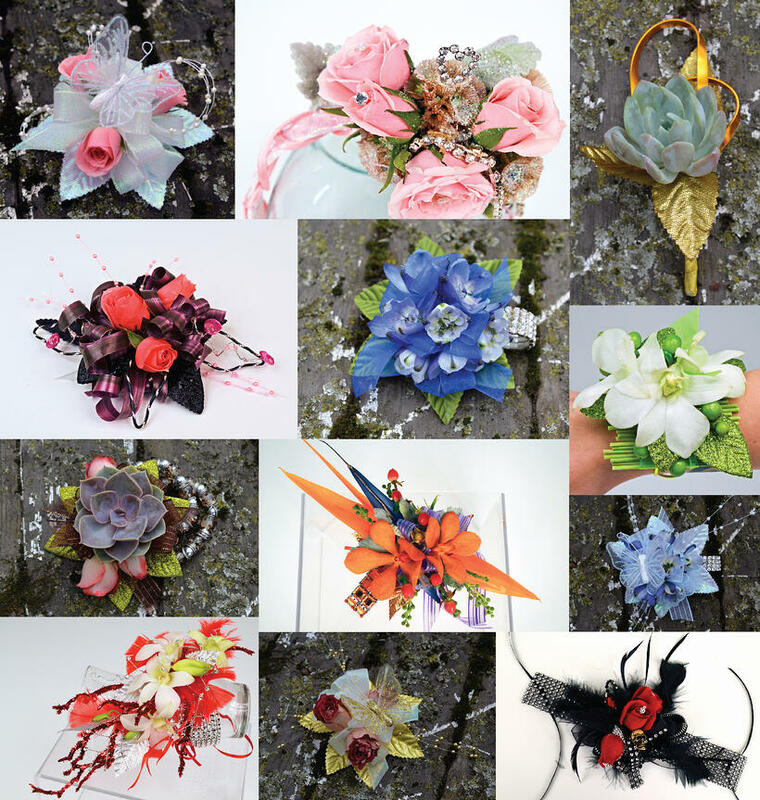 And while the prom specialists at Gillespie Florists have a pulse on all the most popular accessories for this year they also have grabbed some alternate fabulous pieces for making the perfect corsage. Our accessory selection is vast with rhinestones, pearls, metallic gold, silver, beads taking shape of necklaces, bracelets, arm bands, head pieces, rings, wands, and can even be used on your shoes! And ribbons? More styles than you can throw color swatches at. So many cool accessories, so few proms to strut your stylish ensemble. Which is even more reason not leave home without the perfect complement to your prom dress...besides your date or your bestie. Nutshell version: Bring in corsage/boutinniere ideas, colors, etc. (or give them to your date or parental unit along with our phone number, ever so subtly) and we will make something perfect and amazing to make your Prom Night a dream come true. 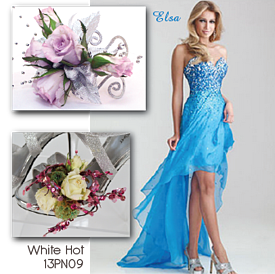 Check out our extensive prom collection for inspiration!